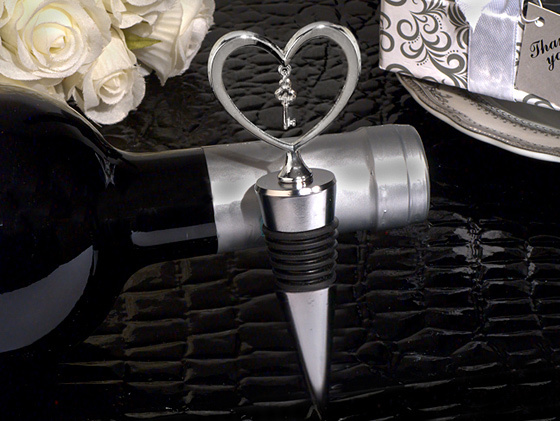 With a bottle stopper and cork screw, you've got what you need to start a great wine night! The perfect little favor for a wedding or bridal shower, Kate Aspen's Cheers to a Great Combination Gold Wine Set comes equipped with an open-heart design bottle stopper and matching corkscrew in a shiny gold finish. Packaged in a presentation-ready gift box, this wedding favor gift set makes a wonderful impression and presentation! Gift set is packaged in a presentation-ready gift box featuring a beautiful white and gold striped design, a black bow on top, and a black ribbon behind a gift label featuring the words "Cheers to a Great Combination"